Campylobacter is a major food safety problem in the poultry industry, but what can processors do to reduce the infection rate? Manpreet Singh from the Department of Food Science at Purdue University discusses the issue. Recent pathogen-food pairings attribute Campylobacter contaminated poultry to more illnesses than any other bacteria-food combination, and contaminated poultry alone has the greatest public health impact in the US among all foods. A survey by the UK Food Standards Agency found that 73 per cent of chickens sold through retail channels tested positive for the presence of Campylobacter. Historically, the United States Department of Agriculture-Food Safety Inspection Service (USDA-FSIS) focused on regulating the prevalence of Salmonella spp. on raw poultry products. More recently, the industry has maintained steady control of Salmonella spp. and attention has shifted towards Campylobacter. To combat the issue, the United States Department of Agriculture-Food Safety Inspection Service (USDA-FSIS) has implemented stringent Campylobacter performance standards. Hence, performance standards have been implemented concerning Campylobacter on raw poultry, wherein a tolerance limit of 10.4 per cent prevalence in young chickens has been set. The compliance to such standards is projected to result in the reduction of more than 5,000 Campylobacter infections in the US annually. As a zoonotic pathogen, Campylobacter is a common poultry commensal (an organism that benefits from living inside the poultry organism without causing any substantial adverse effects) and is a well-known cause of human gastroenteritis worldwide. Estimates for the US itself account for in excess of 800,000 episodes of foodborne illnesses annually. Campylobacter commensally colonise the avian intestinal tract and proliferate at temperatures around 37 to 42°C. Campylobacter grows under microaerophilic conditions with low oxygen; therefore, the intestinal tract of commercial broilers is a favourable environment for its growth. Similar to other bacterial pathogens, Campylobacter can enter into a Viable But Non Culturable (VBNC) state in which the bacteria will not exhibit growth on traditional laboratory media although the pathogen can return to a culturable state and retain pathogenicity. How do poultry processors try to reduce Campylobacter? The poultry industry is a highly competitive and efficiency driven agri-sector, where the health and growth efficiency of broilers during live production, processing, and consistency in quality during manufacture are given high priority. However, the industry is consistently challenged by factors such as changing economic conditions, awareness and misconceptions regarding foodborne illnesses, and changes in meat consumption patterns. The evolution of the regulatory landscape necessitates the use of antimicrobials in poultry processing. More importantly, the application of novel antimicrobials at various points throughout poultry processing can be useful to aid in meeting regulatory requirements. In an attempt to reduce and eliminate Campylobacter, researchers have used a variety of antimicrobial treatments and application methods, especially during the immersion chilling process. The primary reasons for using antimicrobial treatments during immersion chilling is to extend contact time, the overall washing effect on carcasses, and a further scrubbing effect to reduce attached bacteria. Chemical treatments such as Sodium Hypochlorite (Chlorine; SH), Peroxyacetic Acid (Peracetic Acid; PAA), Cetylpyridinium Chloride (CPC), and TriSodium Phosphate (TSP) have shown to be effective in reducing Campylobacter on raw poultry. Each of these treatments has advantages and disadvantages for processors, but ultimately the decision amounts to finding a safe, cost-effective, and reliable product that is a proven food safety solution. Bola Lafe, the Managing Director of UK sanitiser company Aquaint, said: “Campylobacter is a food bug mainly found on raw poultry and is the biggest cause of food poisoning in the UK. With this new epidemic at the forefront of consumers’ minds, as well as regulation bodies’, retailers need to ensure that they are doing everything they can to combat the bug. “Aquaint is a 100 per cent natural, eco-friendly water-based sanitiser that kills 99.9 per cent of bacteria in seconds. Water provides the base for the product to be highly effective as a cleanser and its only other ingredient, Hypochlorous Acid, provides its anti-bacterial properties. Hypochlorous Acid is a harmless, natural acid produced by the human body to kill bacteria. “In Japan, 'Hypochlorous Acid Water' at very specific concentrations (identical to Aquaint sanitising water) is approved by the Japan Ministry of Health, Labour and Welfare as both a 'Food Additive' and a 'Food Sanitiser'. "It is also approved by the Japan Ministry of Agriculture, Forestry and Fisheries as an effective means of managing poultry production sanitation. It is used for a long list of things right from on the farm to inside the kitchen. "In comparison to the UK, where according to the FSA, the actual number of Campylobacter food poisoning cases each year (including unreported cases) is estimated to be 500,000 to 1 million, the actual number of cases in Japan is less than 2,500 per annum and zero deaths according to figures reported by the Ministry of Health, Labour & Welfare for the last 5 years. "In fact, in its ‘Poultry Production Sanitation Management Handbook’ the Japan Ministry of Agriculture, Forestry and Fisheries reported a 50 per cent reduction in levels of Campylobacter at farms that utilise the water. 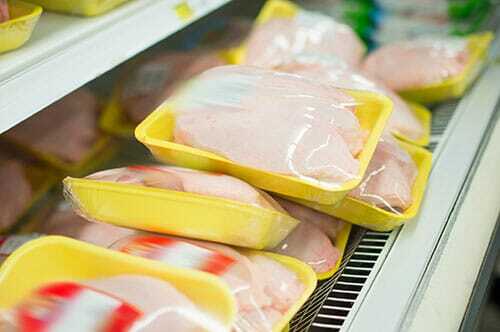 “Other products that claim to combat campylobacter use brine (salt water) at a much higher pH. This will almost certainly affect the taste and quality of the meat." Current research shows that completely eliminating Campylobacter is a challenging task and maintaining a multi-hurdle approach in commercial poultry processing facilities will prove to be the most effective method to achieve performance standards for this pathogen.